Everyone needs a Hobby something to help you relax, something to do in your spare time. Myself I find Aquariums and fish to be very peaceful. 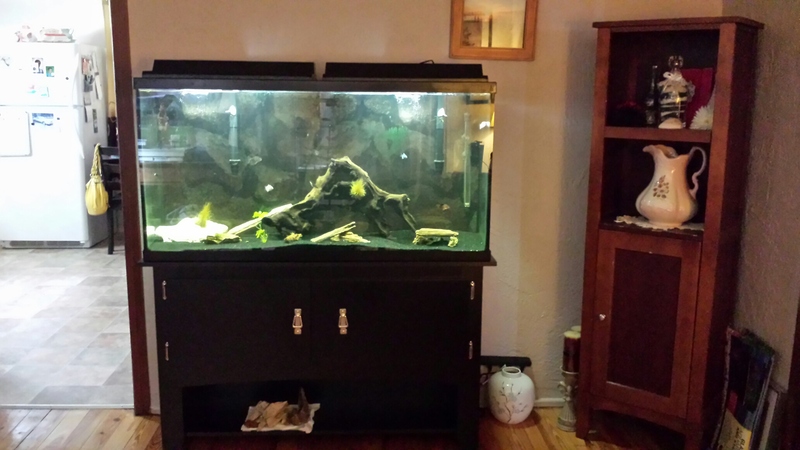 We have a beautiful 20 gallon in our dinning room, and a 60 gallon in our living room. We just purchased a 20 gallon bow front from a co-worker and will be setting it up in the future. It will be sometime though before I begin on the Bow Front believe it or not there is a lot of planning that goes into setting up an aquarium , well when I set one up. Both Aquariums are live planted, neither are saltwater I had thought about doing one and I still may in the future but right now it would be to much work. The live plants in both are plants that I have planted, with the help of Arianna. I have started planting live Java Moss as well. Soon I will be adding more driftwood and will be adding live Christmas moss, and Taiwan moss as well as weeping willow moss. The Moss is really pretty simple like the driftwood you are going to see along with the petrified wood, I have attached the moss myself. 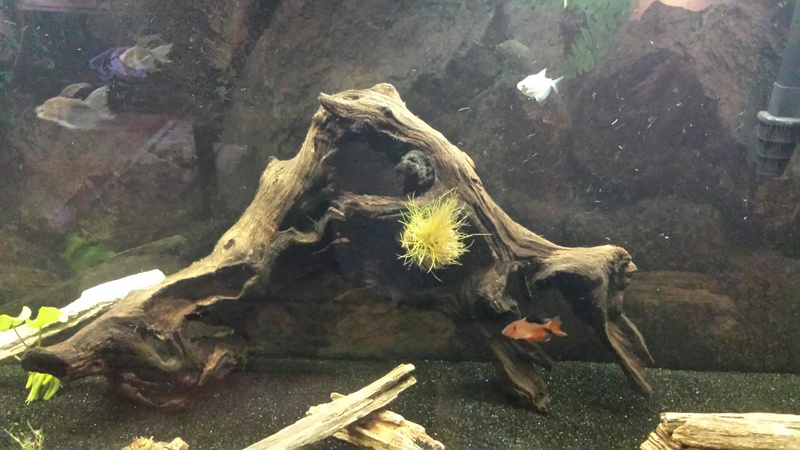 You take the driftwood and you spread the moss out evenly. I use sewing thread and wrap it around the wood and the moss and it holds it in place. In about seven days the moss attaches itself and from there it just grows. Not only is it beneficial to the aquarium but it is to the fish as well, it helps keep the water in check. We have some pretty basic fish a few neon tetras , a molly which I can touch,a few different catfish , but our two newest are very unique. 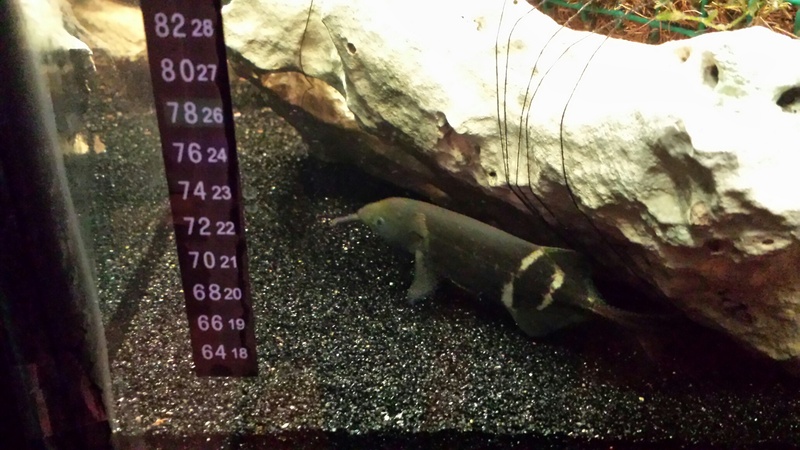 One is the Raphael Catfish, which Arianna wanted but the same day we purchased an Elephant Nose Fish. The owner of the pet store gave us the fish at cost which was really nice of her. 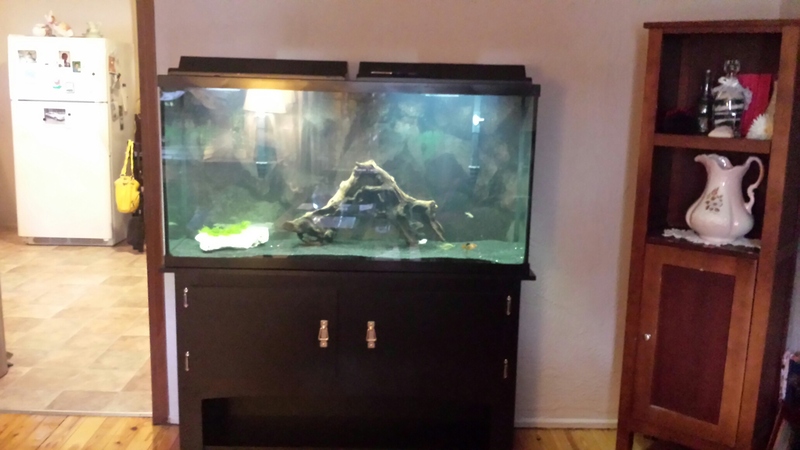 As you will see from the pictures we have both put a lot of time in setting the aquariums up, and the 60 gallon I am no where near finished. They are very peaceful to watch I find it very relaxing and just sitting back and looking at something you have done from scratch. Something that you have created. I find it funny when I get home and I walk in from the Florida room into the kitchen when I step in front of the Aquarium all the fish swarm towards me knowing I am going to feed them. 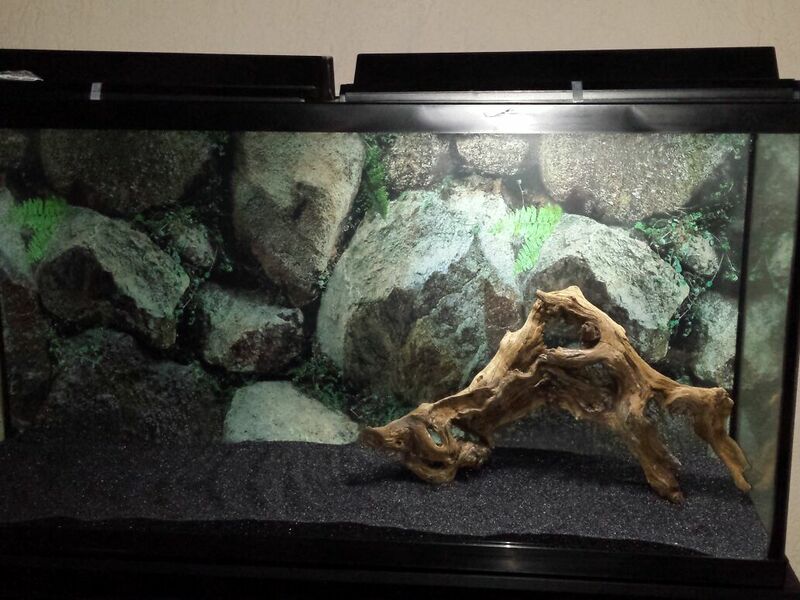 The same with the 60 gallon. I am going to show a few pics from the start of the setup to present. As well as my prize possession the Elephant nose. They are not only very intelligent but in time will even let you touch and hand feed. We had to add a PVC pipe for him to sleep in, it acts as a cave, a hide away for him or um her. Arianna picked out the back ground, I think its very cool. 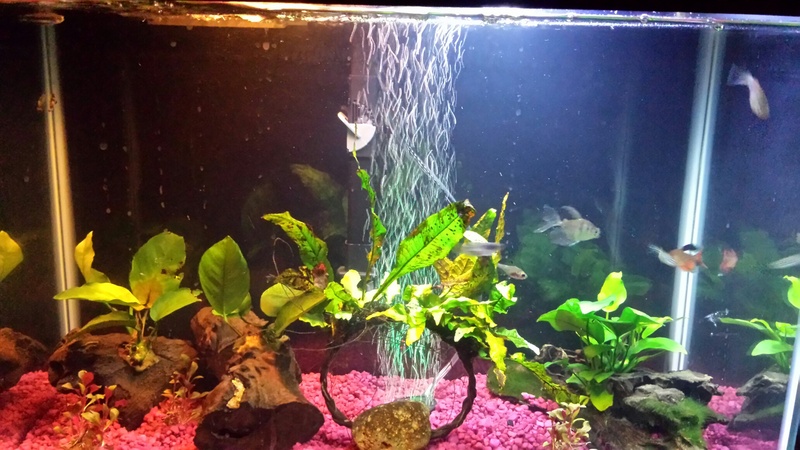 This is our 20 gallon all live plants. 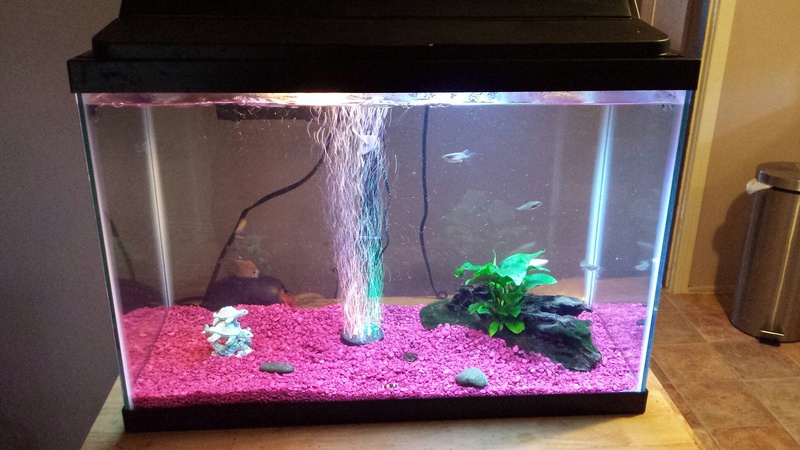 This is the 20 gallon before anything was put in we only had a few fish, now there are about 25 or so in it. 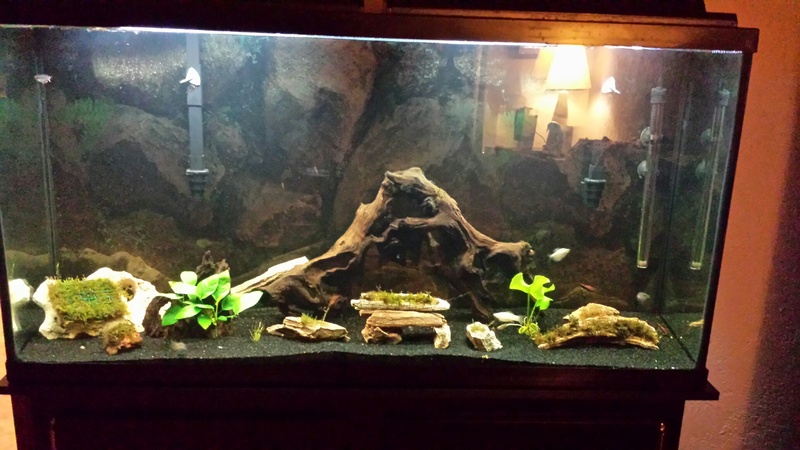 This is the Driftwood Arianna picked out and the beginning of the plants. 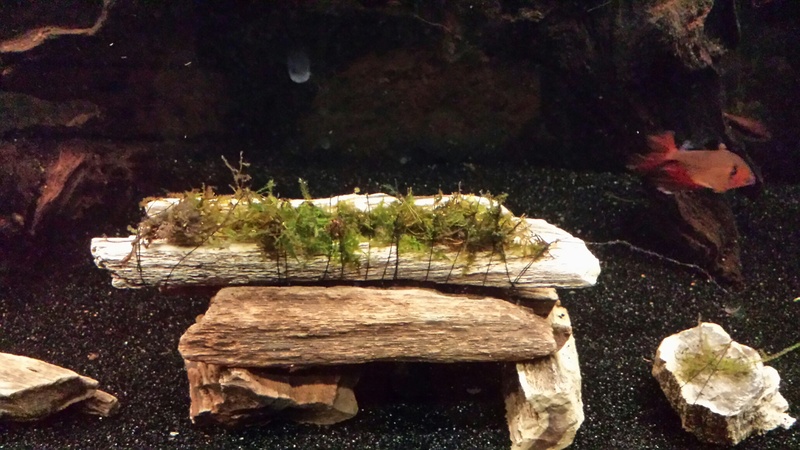 Here on the white rock you can buy Java Moss in square sheets, I attached it with thread, it will soon begin to spread and cover the whole rock, the same with the petrified wood you can see where I attached the Moss to it and soon it will cover the wood. Arianna planted the Banana plant which it to the right. In the very beginning stages ….. 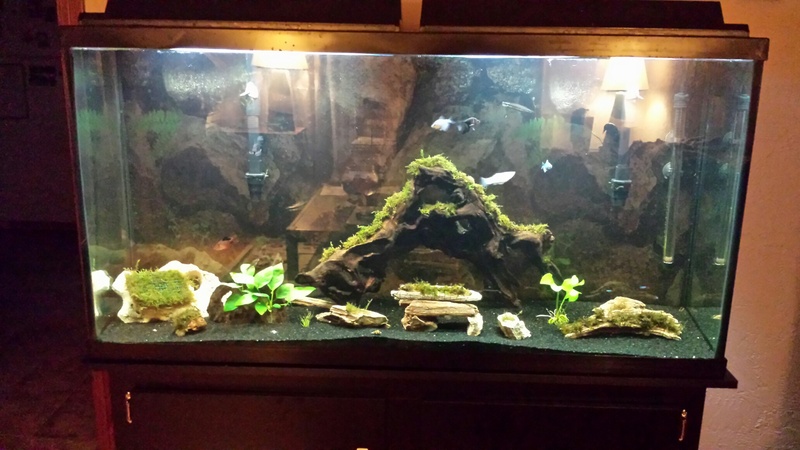 This is the 60 gallon you can see where I attached the moss to the driftwood. It took both Arianna and I to do it, she had to hold it while I tied the moss down. It took less than seven days for the moss to attach. Soon the moss will cover the driftwood and it will move like long hair in the wind. 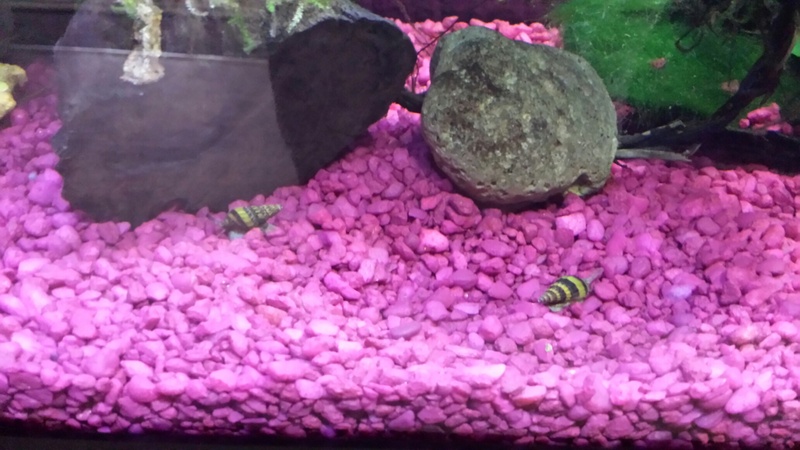 These little guys are called assassin snails when you buy plants they come with snails attached. So you buy these little ninjas and they hunt down and kill the bad snails very very cool. 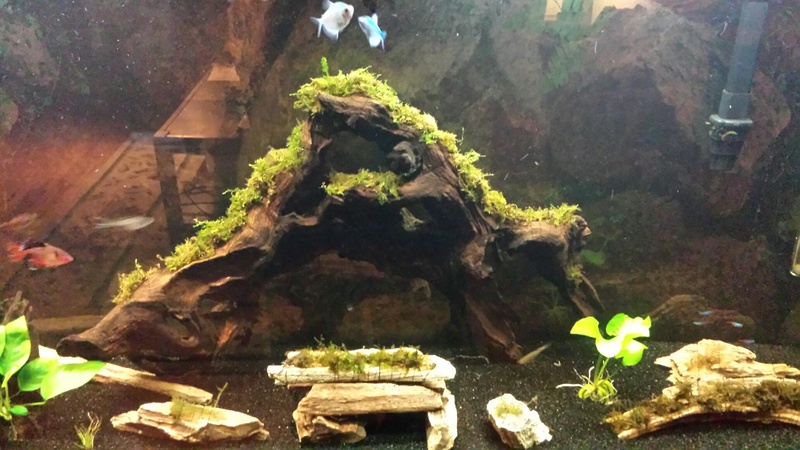 A full pic of the now I will be moving the driftwood down to the left and adding one more that is when I will add the different mosses. Here you can see how the thread is on the wood holding the moss down. In another couple of days the moss will take hold. My little Elephant Nose. He will grow to about 8 to 10 inches. He is very fun to watch.